Rabbi Josh Grajower is a graduate of Yeshiva University and Ner LeElef. He is also a Teacher at Weinbaum Yeshiva High School, in Boca Raton, FL. You can follow him on Twitter @joshgraj. The internet has created many challenges, but has also provided amazing opportunities. One major success of the internet is the proliferation of knowledge. In the Torah community, the internet has allowed Jews across the globe with limited Hebrew skills and background, to access many different areas of the Torah. This provides new meaning to the Gemara (Kiddushin 66a) that the Torah is placed in a corner; anyone who wants can come and learn it. In my classes my students are often the beneficiaries of others’ hard work in making Torah accessible to the public. 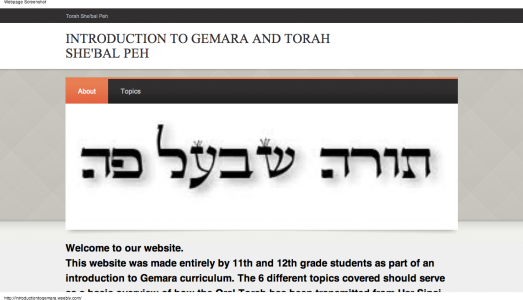 This year in Gemara class, I wanted to give my students the opportunity to share what they have learned and to give back to the online Torah community. At the beginning of every year, our school has a mini-curriculum which serves as an introduction to Gemara. This exposes the students to many different important aspects regarding the history of the Torah She’bal Peh (e.g. which parts were given on Har Sinai, why it was eventually written down etc.). This year, instead of simply teaching the material to the students, I decided to create a project. Students were divided into groups to prepare different parts of the mini-curriculum. After two days of preparing the material, each group was responsible to teach its material to the class. The project culminated with the class creating one website, each group contributing the material it learned and presented to the class. My goal was to create a website which could then be used by Jews around the world to gain more background knowledge regarding the transmission of the Torah She’bal Peh. We used a platform called Weebly to create the website. It is a free site that is both user-friendly and professional. Each group had access to the website and was able to upload their content. Before publishing the website, I proofread the work and had students make any necessary corrections. Looking back, I am confident that our project was a great success. It was well received by fellow educators who appreciated the ease of use and the new and exciting way to allow students to demonstrate their mastery of the material. Most importantly, my students found this project to be fun, engaging and meaningful. 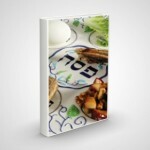 Beyond seeing the value in learning the information, they appreciated that they helped make Torah accessible to anyone. Please check out our website at introductiontogemara.weebly.com!